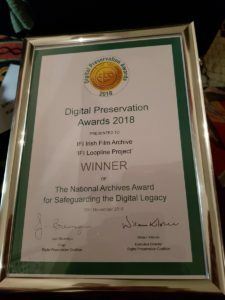 November 30th 2018: The Irish Film Institute last night won a prize at the prestigious international Digital Preservation Coalition Awards, held in the Amsterdam Museum. The award, presented to Kasandra O’Connell and Kieran O’Leary of the IFI Irish Film Archive for its pioneering work on the IFI Loopline Project, was given in the Safeguarding the Digital Legacy category. 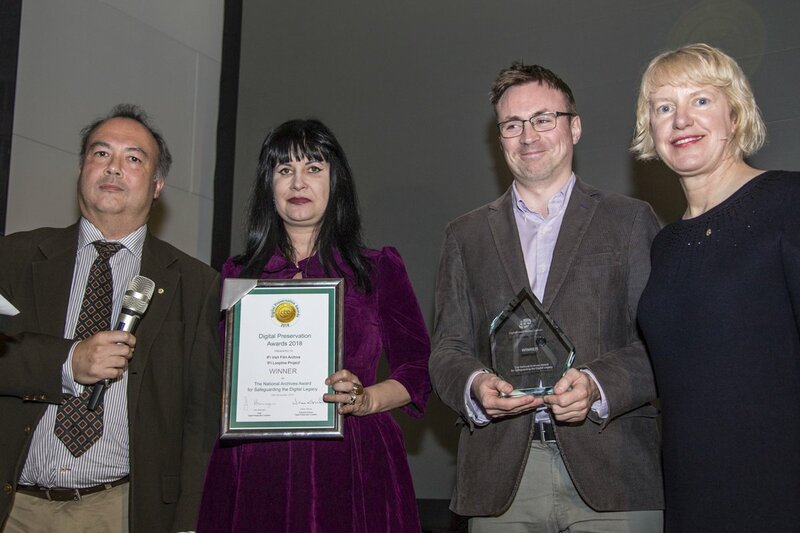 The IFI was nominated alongside the White House Historical Association Digital Library, the UK Parliamentary Archives, and the West Sussex Records Office, Wiltshire & Swindon History Centre. The IFI Irish Film Archive was inspired by the Open Source Software community to develop a suite of 55 open source scripts, known as the IFIScripts, to support and automate its digital preservation activities in a sustainable and efficient manner. The IFIScripts have since been shared with the preservation community worldwide and have been adopted by a number of peer institutions internationally including the British Film Institute and the University of California, Berkeley. Solving problems in-house substantially reduced maintenance costs and vendor fees, and allowed the IFI Irish Film Archive to take control of its preservation workflows. Not only have IFIScripts helped the IFI Irish Film Archive fulfil its digital preservation remit within its limited staff and financial resources, but they have completed their first end-to-end application on a preservation project for a collection of material from leading Irish production company, Loopline Films. The project necessitated creating new custom tools, including the creation of a computer programme that allowed the IFI Irish Film Archive to identify where there were multiple copies of the same file, partial files and fragments, and devising an automated way to appraise the 350,000 objects concerned, as it would have been impossible to watch and assess each individual item otherwise. The team drew up guidelines that allowed them to identify duplicate and corrupt files which were then isolated and eliminated via a verification tool. The IFI Loopline Project, funded by the Broadcasting Authority of Ireland (BAI) and The Ireland Funds, has focused on cataloguing and preserving the output of Loopline Films, run by filmmaker Sé Merry Doyle. This collection provides an unparalleled record of key areas of Irish history and culture from the 1990s to the present day, documenting a transition in Irish society pre-Celtic tiger and post-economic crash. In addition to material chronicling the rapid social and economic change in Ireland during the late 20th century it includes interviews with international cultural figures such as Martin Scorsese. In 2017, Loopline closed its studios and transferred its holdings to the IFI Irish Film Archive, the first tranche of which will be available on the IFI Player from early 2019. For further information, interview availability, and high-res images, please contact Stephen Boylan (sboylan@irishfilm.ie) at the IFI Press Office – (01) 6795744.